A basket full of bright blossoms will deliver the warmth of sunshine even when the skies seem gray. This beautiful gift will be appreciated for its life-affirming brilliance and your thoughtfulness at this time. 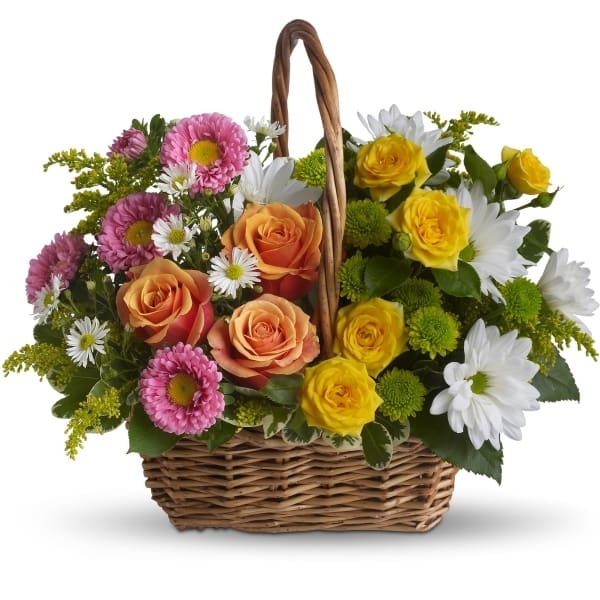 Brilliant blooms such as orange and yellow roses and spray roses mix with pink matsumoto asters, white daisy spray chrysanthemums, dazzling green button spray chrysanthemums, salal, pittosporum and more in a lovely rectangular basket with a handle. 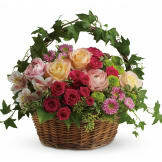 • This basket will be hand designed and delivered by a local florist. Flowers will be received by a Nordike Funeral Home's staff. Overall, this was a beautiful basket with wonderful colors. The size of the basket was a bit smaller than I expected, especially for the price. The family remembered that basket because of the colors. The basket was lovely. It was the perfect size for the service and to go home with the family. It was difficult to choose flowers for a service for a young teen aged boy, this basket was perfect. The delivery was on time just as promised and using the Sympathy Store was affordable and I was grateful to be able to order flowers without having to call and talk to a florist shop during this difficult time. It was beautiful and delivered for the service in plenty of time. Had no problems ordering and receiving confirmation the order was received and delivered. Would recommend to anyone needing this service. Ordered these for a funeral, beautiful just like the picture! I ordered this basket of flowers quite late on the night before the service. As promised, they arrived at the funeral home with plenty of time to spare. I appreciated receiving an email letting me know the basket of flowers had been delivered. Excellent service! Thank you. Ordering process was quick and simple. Flowers were delivered in plenty of time. One person told me the flowers were beautiful, although I never actually saw them for myself. The recipient said the flowers were beautiful. I liked the correspondence I got with the purchase. It made me feel better knowing they have been delivered without actually seeing them. Thank you! Basket turned out very nice. The basket was large and lovely and many people mentioned that fact to me. I would have preferred that the card would have been placed more discreetly. It was only necessary for the family to know who sent it. The arrangement was definitely a "wow, that looks great". I was very pleased with the purchase process and commitment to delivery on the same day. Thank you. Beautiful, everything I hoped it would be! While we were informed the flowers were beautiful. The basket I ordred, for an out of state funeral, was very well put together and very lush! Thank you so much for taking care of my needs. I did not have a chance to see the finished basket , for I am miles away, but the experience was pleasant. My name was misspelled at first, there was a bad reception on the phone. When I noticed the mistake in the posting I called to correct it and it was corrected on the delivery card. My Aunt called me immediately after receiving this basket, thanking me and commenting on how beautiful and the lush the arrangement was. All of our flowers are designed and delivered by hand from a local florist in in Carlyle.